Crutch Camp is a four-week high-energy boot camp designed to tone muscle and burn calories. We utilize a mixture of exercise bands, medicine balls, plyometrics, body weight and a whole lot more to ensure you get a great workout no matter what your fitness level. This boot camp is uniquely structured to allow you to set your own pace, yet challenging enough to help take you to your next level. We like to get outside and take advantage of the great outdoors when weather permits and move indoors to the gymnasium during inclement weather. At Crutch Camp, we believe in combining innovative programs with uniquely motivating training to inspire you and keep you coming back. Classes are now held at Results Fitness (music row), 1617 16th Ave. S. Please text Bill at 615-957-1668 to sign up for each class. Check out the Calendar HERE for Boot Camp times and dates. • Your personal health and safety is our number one priority. If you have any medical condition(s) that could affect your workout in ANY way, please bring a doctor’s note before your first class. We advise you not to start any Crutch Camp session without it. It is extremely important that you inform the instructor of a condition in order to keep you from getting hurt. • Payment must be made at or before your first session or class using cash or check. • All sessions begin promptly at the designated time. Plan to bring 1-2 bottles of water to each session. Classes are held rain or shine and we don’t always go inside just for rain. Please wear appropriate clothing for the weather. • Any changes or updates to classes or schedules will be sent as a text to your cell phone and/or emailed to you asap. • It is strongly recommended that you do 30-60 minutes of cardio 2 days per week in addition to the sessions. • Crutch Camp is an independent training program and is not affiliated with any gym or organization. Group workouts aren’t for everyone. That’s why Bill created his acclaimed one-on-one and one-on-two private personal training sessions. These custom tailored sessions last for one hour and are ideally suited for giving you individual attention while working on reaching your personal fitness goals. All private sessions also offer access to showers and locker rooms. Call for locations and prices. Bill also offers individual training for runners and athletes. Call 615-957-1668 or email us at crutchcamp@gmail.com for more information. • Any changes or updates to sessions will be sent as a text to your cell phone and/or emailed to you asap. Bill Crutchfield has more than 25 years experience as a Certified Personal Trainer and has been a competitive runner for more than 30 years. He has a Bachelor's Degree in Health and Wellness from the University of Arkansas at Monticello and is certified by the ASFA. Recognized as one of Nashville’s elite trainers, he has owned his own gym and has worked with some of the best trainers in the business. In 1993, Bill created the concept of tour training—becoming the first personal trainer in Nashville to hit the road with a traveling artist. Since then, he has worked with some of the biggest artists in the industry. His long list of tour training credentials include many country music artists such as the Dixie Chicks, Trace Adkins, Chris Young, Miranda Lambert and more. Bill has also trained top record producers, songwriters, business executives and celebrities. In 2007, he founded Crutch Camp, his unique version of boot camp. His love for the outdoors and desire to help his clients feel their best has made these camps a huge success. Described as "firm, yet gentle at the same time," his innovative programs along with his motivating personality inspire his clients to keep coming back. When not teaching Crutch Camp, Bill devotes several days a week to one-on-one personal training and running sessions with clients desiring more individualized attention. If you would like to discuss your individualized training needs, call 615-957-1668 or email him at crutchcamp@gmail.com for more information. With more than two decades of personal and tour training expertise, Bill Crutchfield has become recognized as a leading fitness innovator. Here is what the press has to say about Bill’s unique approach. "Bill Crutchfield is a great guy with great stories about how to work out, how to eat and combines it all with a great sense of humor." Bill Crutchfield has also had articles printed in Shape and WebMD magazines. At Crutch Camp, we believe in combining innovative programs with uniquely motivating training to inspire you and keep you coming back. Here’s what our clients have to say about the fitness results we help them achieve. "I look forward to every workout with Bill! I've found that when I workout by myself, I give up way to early. Bill doesn't allow you to give up, he pushes you to the max, but in a way that doesn't make you mad or frustrated. That's what has brought me back again and again for over 2 years!" "The thing that makes Bill extraordinary is his ability to assess and challenge not just your body, but also your mind, spirit and overall perspective on healthy living." "7 years. 1,000 classes. That’s how long I’ve been working out with Bill. Through it all, I have never been bored or felt like I needed a change. The reason for this is simple. Bill finds a way to challenge me each and every time I come to his class. He tailors his classes for all fitness levels and he inspires us to dig deep and reach for the next level, whether it is our first class or our 1,000th." 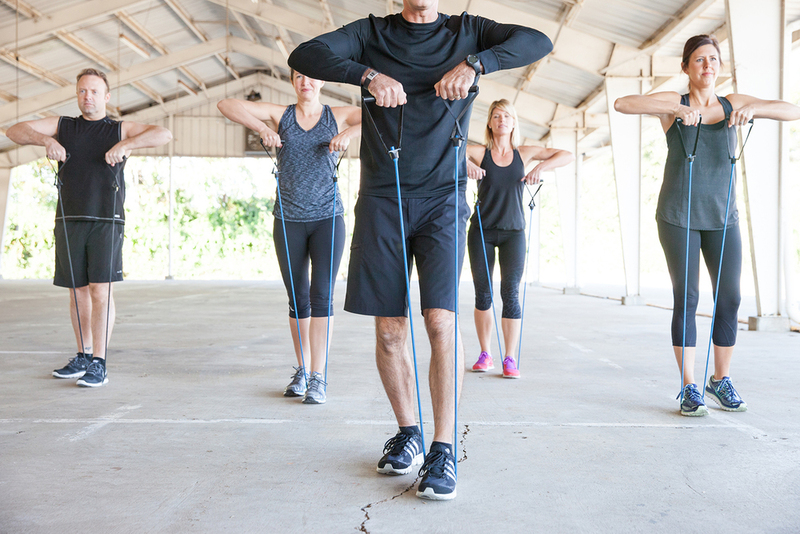 " Bill does a great job combining cardio vascular drills and toning and tightening exercises.I love that he mixes things up so it never gets boring. Not only is Crutch Camp a great physical workout it also makes me feel good mentally and gets the day off to a great start. I have so much more strength and stamina than I did prior to working out with Bill. I've been doing Crutch Camp for almost seven years and I still love it!" "Bill helped me lose 30 lbs and greatly improve my stamina and core body strength... without injuring myself. That's not an easy thing to do in your late 40's!"